Chris Wilder has resigned as manager of stricken non-league side Halifax Town after six years and joined League Two outfit Bury as assistant manager. 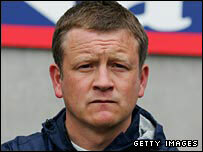 Wilder, in charge since July 2002, is friends with Shakers manager Alan Knill, a former Halifax defender. Wilder's departure comes after the club were demoted three divisions to Unibond Division One North after failing to get a Company Voluntary Arrangement passed. Halifax hope to appoint Wilder's successor in the near future. Wilder remained fiercely loyal to the West Yorkshire club during his tenure, as he battled against boardroom strife and one of the lowest budgets in the Conference. The former Halifax player remained at The Shay despite being linked with moves to Chester City, Hartlepool United, Rotherham United and Cambridge United, where he appeared destined for in September 2006. Wilder guided Halifax to the Conference play-off final in 2006, where they lost to Hereford in extra time. Meanwhile the club expect to reveal their new name soon, upon written confirmation of the Northern Premier Football League's acceptance of the newly-formed club.